Provo • Losing by 22 points in a game in which it trailed by as many as 36 is certainly not the way BYU’s basketball team wanted to finish the nonconference portion of its schedule and wrap up the 2018 calendar year. The Cougars were competitive for only the first 10 minutes Saturday in an eventual 103-81 loss to Mississippi State in Starkville, Miss. Now the question has to be asked: Will it get worse before it gets better? Having lost three straight for the second time this season and having posted the worst nonconference record (8-7) since the year before coach Dave Rose replaced Steve Cleveland in 2005, the Cougars turn their attention to their West Coast Conference slate this week. Rose told the BYU sports network after the blowout loss that his players “got discouraged” and “didn’t compete at the [appropriate] level” and lacked the “urgency and intensity” needed to contend with the No. 19 team in the country. The bad news for BYU is that, unlike in previous seasons, the WCC probably won’t be the sight for sore eyes the Cougars have come to expect. They easily could have a sub-.500 record when they return to Provo for their first game at the Marriott Center in nearly a month next week. BYU plays at much-improved Pacific (10-5) on Thursday, then travels to Saint Mary’s (9-6) on Saturday. The Tigers have won five of their last six, and defeated BYU 67-66 last year in Stockton; The Gaels have lost to BYU in Moraga just once, 60-57 in 2014, since the Cougars joined the WCC in 2011-12. There’s no longer a “Big Three” in the league because Saint Mary’s is rebuilding, this BYU team with five or six players who were at least four-star recruits and/or top-200 prospects coming out of high school has underachieved and the WCC’s perennial mid-level teams such as San Francisco, San Diego, Loyola Marymount and Santa Clara have all improved immensely. Gonzaga, ranked No. 7, stands alone at the top, and nobody else is remotely close. Judging by how the WCC teams performed in non-conference games, the Cougars are staring at the prospects of finishing in sixth place, or worse, in conference play. They’ve never finished below third. The Cougars’ schedule hasn’t been all that difficult, either. Consider this sobering fact: Hours after BYU was drilled by Mississippi State, the San Diego State team that walloped BYU 90-81 on Dec. 22 lost 82-61 at home to Brown of the Ivy League. 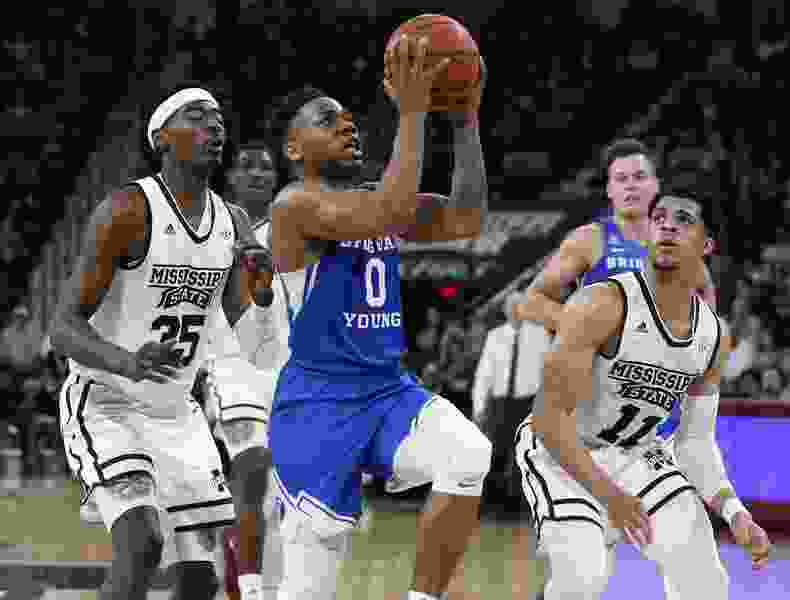 BYU’s shortcomings have been plentiful, but the most glaring weaknesses appear to be familiar ones: suspect perimeter defense, poor 3-point shooting, and turnovers. Often times, the turnovers have led to easy baskets for opponents, especially on the road. The Cougars have given up an average of 97 points in their five true road games, all losses. The were minus-11 in points off turnovers at MSU, minus-9 in points off turnovers at SDSU. Because right now, the program is going in the wrong direction, and the WCC can no longer be considered the cure for what ails the Cougars.